Automatically Wakes up, Measures Temperature and Stores Values in 8kB of Datalog Memory in 8- or 16-Bit Format. Accuracy of ±0.5°C from -10°C to +65°C. Water resistant or water proof if placed inside DS9107 iButton capsule. Sampling Rate from 1s up to 273hrs. 512 Bytes of General-Purpose Plus 64 Bytes of Calibration Memory. The DS1922L temperature logger iButtons are rugged, self-sufficient systems that measure temperature and record the result in a protected memory section. The recording is done at a user-defined rate. A total of 8192 8-bit readings or 4096 16-bit readings taken at equidistant intervals ranging from 1s to 273hrs can be stored. In addition to this, there are 512 bytes of SRAM for storing application-specific information and 64 bytes for calibration data. A mission to collect data can be programmed to begin immediately, or after a user-defined delay or after a temperature alarm. Access to the memory and control functions can be password protected. The DS1922L is configured and communicates with a host computing device through the serial 1-Wire protocol, which requires only a single data lead and a ground return. Every DS1922L is factory-lasered with a guaranteed unique 64-bit registration number that allows for absolute traceability. The durable stainless-steel package is highly resistant to environmental hazards such as dirt, moisture, and shock. Accessories permit the DS1922L to be mounted on almost any object, including containers, pallets, and bags. A: Thank you for the inquiry. The DS1922L-F5# pricing on the website is the per unit cost. We are happy to ship to China. You can place an order online or email sales@embeddeddatasystems.com with a PO. Also, the DS1922L-F5# is currently in stock. 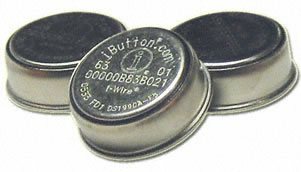 A: In the DS1922L, I'd suggest having the face of the iButton (part with the etching) against the surface to be measured. Logging rate – faster logging rates consume more power. Logger type – DS1921 models typically perform better from a battery life perspective. Temperature range of operation – batteries perform best at room temperature moving to either extreme reduces performance. The biggest reduction being at the higher operating ranges. Selected resolution (DS1922 & DS1923 only) – low resolution is more favorable to battery performance. General purpose – These units cover a wide range of monitoring needs from freezers up temperature well above those observed in Death Valley. These are commonly used in cold chain applications and a host of bioscience studies. Specialized units – These units have a smaller temperature range but offer a better resolution than the DS1921G while at a similar price point. -5°C to 26°C – DS1921Z ideal monitor temperature sensitive products in transit such as produce & medical drugs. 15°C to 46°C – DS1921H ideal for monitor temperature within climate controlled buildings and body temperature. The Thermochron’s steel enclosures are designed to withstand harsh environments, making these extremely reliable in a wide range of applications. While the Thermochons are considered to be “water resistant” due to their IP56 (Ingress Protection) rating, they cannot be classified as waterproof, and should not be submerged unless accompanied by a DS9107 waterproof capsule. An IP rating refers to the Ingress Protection on any piece of equipment against external objects such as; water, steam, liquid, dust, etc. The format for IP ratings shows “IP” (Ingress Protection) followed by two digits. The first digit indicates the protection against solids, and the second indicates the protection against liquids. See chart below for specifications on protection levels and limitations derived from IEC standard 60529. There are several software and hardware options for the missioning and downloading aspects of the Thermochrons. The most common solution is exhibited by the SK-IB-R – iButton Connectivity Kit, which includes all the necessary components to connect the Thermochrons to your Windows computer via USB, mission the Thermochrons, and download the temperature and/or humidity data. To learn about all the missioning and downloading options, please look at the Starter Kits section of our website.